Nokia's quite into treasure at the moment - first it teases us with a treasure map, now it's unveiled the Lumia-friendly Treasure Tag. Treasure Tags are NFC and Bluetooth-enabled gizmos that you attach to fiddly valuables like your keys or wallet. If you try to leave the house without them, your phone gives off a loud honk to remind you to go back and pick them up. That's assuming you haven't also forgotten your phone, of course. 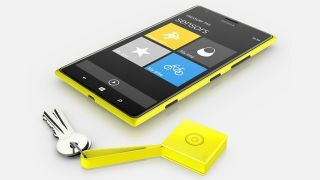 The Treasure Tags work with Lumia phones rocking the Lumia Black update, with apps for iOS and Android in the works too. The Tags will come in blue, yellow, white and black, and will set you back $29.90 (€24.90, around £20) each. They're also proof that sometimes, just sometimes, rumours do come true. It's not quite the booty we were expecting from Nokia's bizzarro pre-MWC treasure map teaser. We reckon there's more to come at MWC 2014.